Like a huge glass lantern, Hardwick dominates the surrounding area – a magnificent statement of the wealth and authority of its builder, Bess of Hardwick. Designed by Robert Smythson, the house is remarkable for being almost unchanged since Bess lived here, giving a rare insight into the formality of courtly life of the Elizabethan age. There are outstanding collections of 16th-century embroidery, tapestries, furniture and portraits. Walled courtyards enclose fine gardens, orchards and a herb garden, and the surrounding country park contains rare breeds of cattle and sheep. 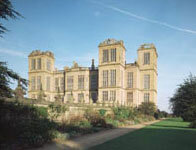 In the grounds are the remains of Hardwick Old Hall, which Bess continued to use after her new house was built. 6½ml W of Mansfield, 9½ml SE of Chesterfield; approach from M1 (exit 29) via A6175. Note: a one-way traffic system operates in the park; access only via Stainsby Mill entrance (leave M1 exit 29, follow brown signs), exit only via Hardwick Inn. Park gates shut 6 in summer, at dusk in winter.